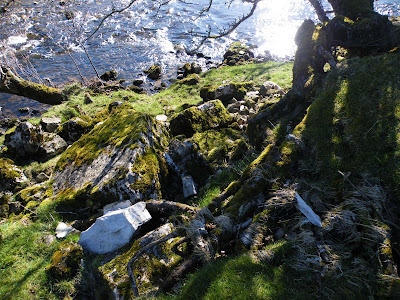 On the South banks of a bend in the River Eden in the Mallerstang valley, there are possibly 4 Bronze age cairns....two visible, one possibly damaged at the river side, and another unidentified as yet. 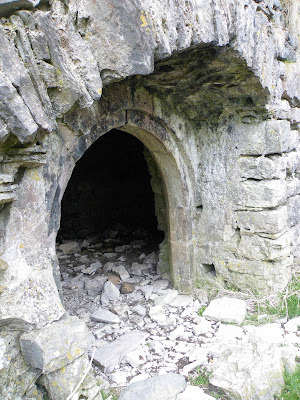 The largest of the two found recently on my visit to Lammerside Tower, is shown above, with collapsed interior and an exposed rim of river washed stones. The centre measures about 15 feet across, and is around 5 feet deep. The rubble at the centre is moss and grass covered, suggesting that its collapse was some time ago. It could of course have been robbed out, causing the damage seen today. The above photo shows the small peninsula that the two cairns can be found on. The largest of the two cairns seen on this visit is on the mound of earth in the centre of the photo. The second, is to the right of the larger cairn, still covered in turf. This photo (above) shows the second of the two surviving cairns. It is only distinguishable from one angle...viewed from other angles it's almost impossible to make the cairn out from the surrounding landscape. The photo above, and below, show panoramic shots of the best of the two cairns. 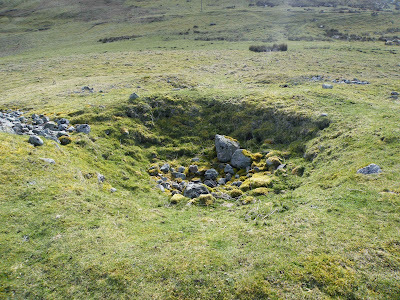 The collapsed centre can clearly be seen, along with the rubble rim, surrounding the centre of the cairn. The stones used to make up the rim are all smooth river washed pebbles, probably collected from the nearby river. Cairns would most likely have contained a human burial, with huge amounts of stone piled upon the body, and sometimes turf being used to cover the stones. Over time, these burial mounds blend in with the surrounding countryside and are sometimes now difficult to find. These two cairns are right on the footpath and so very easy to explore. It will probably come as a great surprise to many, to know that rabbits were not always native to the UK, but originally came from the warmer climes of Southern Europe. Rabbits were introduced to the UK by the Normans, sometime after 1066, and were 'farmed' for their fur and meat. Originally they were not at home in England's climate, and had to be well managed...fed, protected from predators and sheltered from the adverse weather. To enable the small collections of rabbits to survive, artificial warrens were built by wealthy land owners. 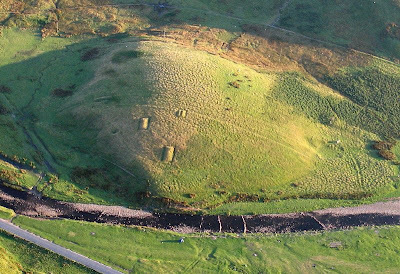 These artificial warrens are today known as 'Pillow Mounds' and can be found all over the UK. 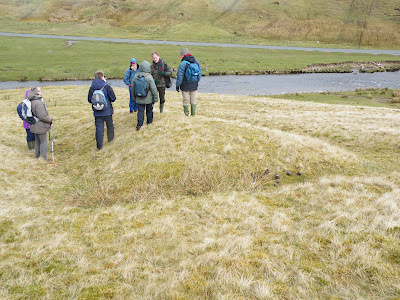 In the past they were sometimes mis-identified as burial mounds, and the three in Mallerstang have, for many years, been known as the Giant's Graves. 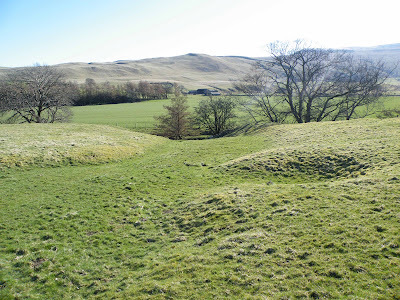 The photo above (courtesy of Simon Ledingham) shows the position of the pillow mounds in relation to the road (bottom left hand corner) the three pillow mounds shown below, can clearly be seen in this photo, with a possible fourth one on the left hand side of the hill side. At the bottom right hand side of the hill, the remains of an enclosure can just be made out, with a track running through it. This could be related to the management of these warrens. A pillow mound typically consists of a low flat topped mound of earth, surrounded by a ditch (as illustrated here) Sometimes a run of tunnels would be constructed for the rabbits, and then earth would be thrown over these runs, creating the artificial warren. 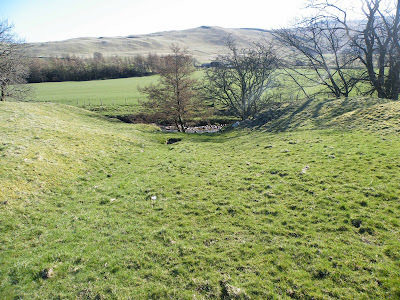 Usually, as at Mallerstang, a ditch would be dug around the warren, and if possible, filled with water. A pale, or fence, would most likely be erected around the lip of the ditch to keep out predators. On Dartmoor, where there are a large number artificial warrens, they are called buries, but elsewhere they are known as coney garths, conegars or conygrees....many villages will have streets or places bearing these names, perhaps harking back to when there were artificial warrens in the area. There is a Conybeds in Kendal, destroyed in 1815, once thought to have been a motte of some sort, but probably an artificial rabbit warren. Cornelius Nicholson, in his 1861 book, The Annals of Kendal, thought these earthworks were an 'exploratory camp'...probably Roman! 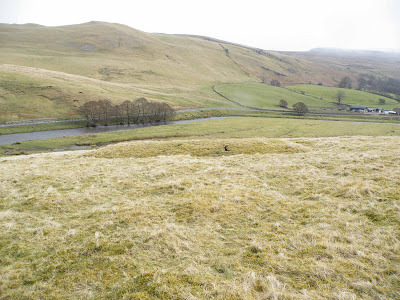 The pillow mounds in the Mallerstang area can be seen on the North facing lower slopes of Birkett Common as you travel along the B6259 between Nateby and Pendragon Castle. They appear as long narrow rectangular shapes cut into the hillside. There are three pillow mounds here, possibly more...but the three that can be seen are the best preserved. One of the mounds appears to have been excavated at some time as it has a shallow trench through its centre. The other two are very well preserved, standing to around two feet tall, and with well defined ditches around them. Each of these pillow mounds are about 20 feet wide, and about 50 feet in length. It's thought that these particular rabbit warrens belonged to the Cliffords of Pendragon castle, about a mile and a half south. It's possible that they were placed here, visible on the side of the common, so that visitors on their way to Pendragon castle could see them from the road. Rabbit was a high status food stock, and anyone with the wealth to import rabbits, farm them and manage the warrens would be able to entertain guests to the highest standards. In order for a land owner to be able to farm his rabbits, a licence was required from the King...providing the land owner with the 'Right of free warren'. Rabbits were hunted like many other animals, but rabbits were the only animals women could hunt....they were excluded from hunting boar or deer. 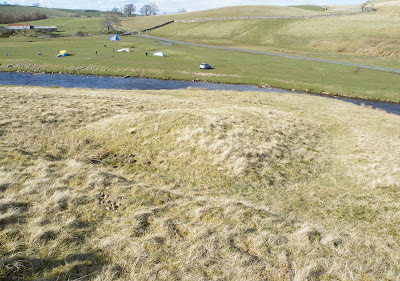 These pillow mounds can be seen from the road across the river, or can be inspected up close by following the footpath past Lammerside castle. It’s looking increasingly likely that Lammerside Tower is in fact the upstanding remains of a gatehouse, and not a pele tower or castle. Despite mentions in numerous books on the subject and a number of writers perpetuating the myth of this building's defensive purpose, these remains could just be one of the attendant buildings of Lammerside….a seemingly complex manorial range of buildings, including stables, a hall (possibly lightly fortified), outbuildings, accommodation for servants and workers, a narrow tower house (built behind the surviving ruins) and an encircling barmkyn or simple curtain wall. The above photo (courtesy of Simon Ledingham) shows the earthwork remains of the barmkyn encircling the manorial site, with other earthworks indicating the sites of buildings and landscaping features. 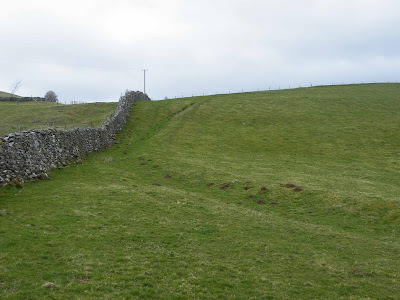 Indeed the whole complex would have been surrounded by this wall, to what height or thickness we don’t know…it could have been a curtain wall, or simply a field wall marking the boundary. 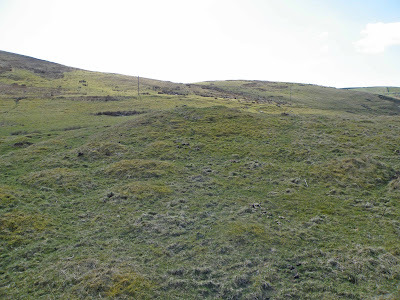 The photo below, shows the earthwork remains of the barmkyn as it snakes over the brow of the hill. It would have continued turning right, out of site of this position, and round the back of the tower's remains, and then joined this portion of the remains from the right. Click on the photo below for a brief explanation of the layout of the Southern end of the complex, including the path of the barmkyn, and the site of the original hall....the manorial accommodation for the Warcop family. The following photo shows the footings of the barmkyn as it passes over the top of the hill to the West of the tower's remains. I'm reliably informed that there are masonry remains beneath the grassed bank that we can see today...indicating a wall of some sort once stood here, indeed, at certain points along the course of the earthworks, and where rabbits and hares have been excavating, rubble has been exposed in a few places. Above. 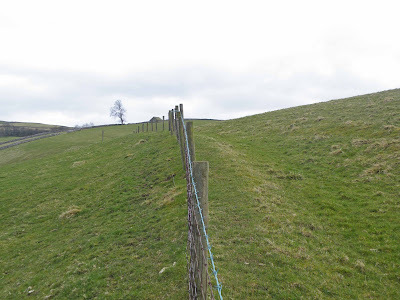 The compound boundary can still be seen today, with a modern fence on top. 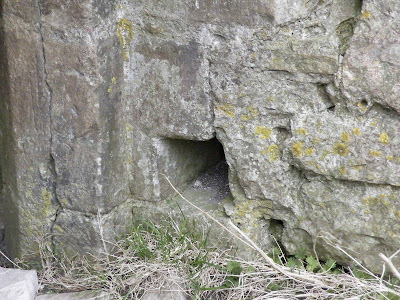 The following photo shows the draw bar slot in the door of the South facing wall. The reason the draw bar slot looks as if it is only a few inches above the ground...is that it is. There is so much rubble here, that the ground has been raised about a foot and a half. The intriguing thing about this draw bar slot, is that it appears to be on the wrong side of the door. It is actually on the outside wall of the tower....which means that if it was used, it would secure anyone stood this side of the door against anyone already in the tower? Confusing. This could re-enforce the view that the tower is in fact a gatehouse, in which case the draw bar slot would be just another level of security against anyone getting past the security of the gatehouse if they'd already managed to break in. Or...it could simply mean that the door had been moved from its original location, and re-inserted into this wall. Another explanation, could be that the substantial rectangular earthworks that lay behind the ruins, could represent the site of a tower of some sort....so that the door, with its draw bar tunnel, may have been put in place to secure the gatehouse entrance to the tower. As more information about this building becomes available, it will be posted here. 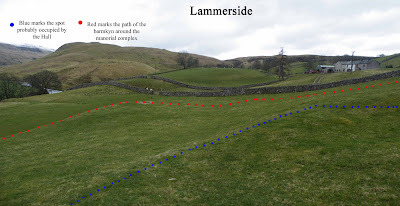 The manorial complex at Lammerside was large and consisted of a hall (possibly fortified) a gatehouse, attendant buildings, landscaped gardens, a barmkyn or simple curtain wall, a road approaching from the South, and to the South East, a bridge over the River Eden. The above photo shows the roads, cut into the top soil and still visible to this day. The road disappears down to the River Eden to the right of the photo, and there are two visible trackways to the left of the photo and in the centre, both leading ultimately to Lammerside Tower, out of shot to the left. The photo above, shows the roadway clearly leading down to the river. The limestone built bridge, probably built by the Warcops when they inhabited the hall at Lammerside, would have had a direct route to the road running through Mallerstang, North to Kirkby Stephen, and South, ultimately, to Sedbergh. 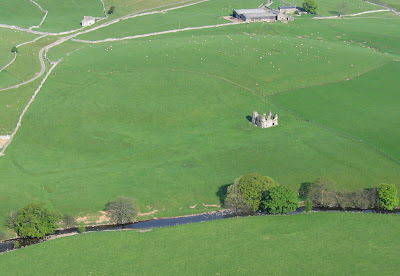 The hall at Lammerside (now long gone) and the tower would have been visible from across the river as guests approached. They would then have seen the hall and all its buildings as they crossed the river, and made their away up the dedicated road heading North. This was all designed to impress those who visited the hall, and to impress on them the importance of the family in the local area. Another view of the surviving trackway leading down to the bridge. The photo above probably shows all that is left of the bridge, dismantled by the Whartons when they took possession of Lammerside. As well as dismantling the bridge, the Whartons tore down the hall, now only a feint earthwork in the hill side, destroyed all the attendant buildings, and probably converted the tower we see today, into accommodation. It is their possession of the Lammerside buildings, that has resulted in the tower mistakenly being identified as a pele tower. In all likelihood, this surviving building was in fact the gatehouse, not the hall (fortified or otherwise) of the complex of buildings. It seems that the Warcops of Lammerside, sandwiched between the Cliffords of Pendragon to the South East, and the Whartons of Wharton Hall to the North West, were in an almost perpetual state of neighbourly dispute, and after many years of bullying by their Wharton neighbours, finally succumbed. The Whartons all but wiped Lammerside and the Warcops off the map.